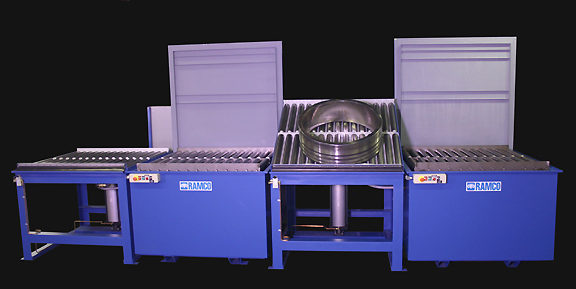 These Aja-Kleen Systems were designed for cleaning and preserving large bearings using solvent. The customer wanted to quickly and effectively remove machining oils and debris from heavy duty bearings. The process required using directional turbulence to clean the parts. The system below had to be capable of easily handling bearings up to 2500 pounds. The construction was heavy gauge carbon steel. The tank rear wall was made of heavy gauge plate with exterior welded structural angles. Roller bearings mounted externally at critical locations evenly distributed the load. 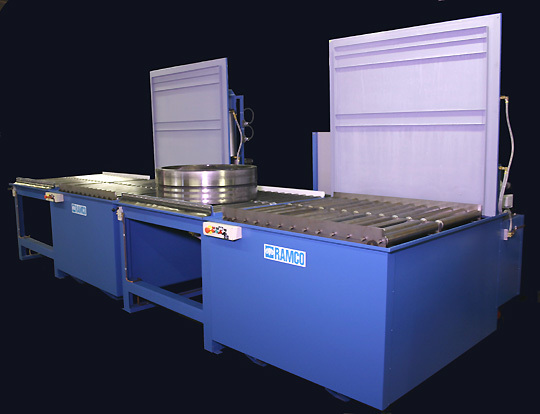 RAMCO Equipment system capable of handling bearings up to 2500 pounds. The system uses an oscillating elevator built of heavy wall rectangular tubing to transport the bearings into and out of the processing chamber and to position and move the bearings within the washing zone. 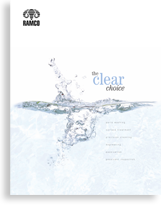 Using the normal up/down agitation stroke of the elevator combined with a comprehensive solution turbulation system provides dynamic cleaning, better coverage and accelerated processing times. The system is electrically heated and includes Nema 12 panels with lockout-tagout disconnects, digital indicating temperature controllers, solution low level safety cut-outs and automatic digital cycle timers. Solution turbulation is provided using vertical immersion pumps located in a rear recessed blisters. Each pump is connected to bottom mounted closed looped manifolds using multiple solution jets directed within the chamber to provide uniform turbulence of the solvent throughout the working zone. 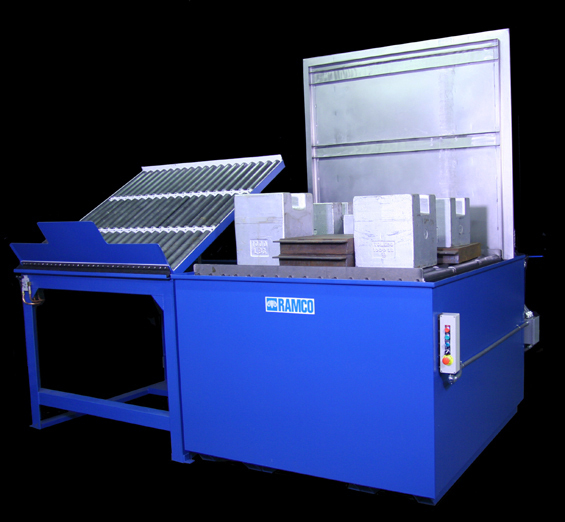 The photo below is of a similar system built for the same customer and designed to handle larger and heavier bearings. The picture, taken during load testing, shows a 6000 pound load on the elevator platform which was easily lifted and agitated.